While scouting a local Toys R Us one day, I was both surprised and happy to see RC toys for the Iron Man 2 movie on the shelves, long before the movie was even released. There are two similar sports cars available in this size, one being the flash "Turbo Racer" I picked up and the other being the gun-toting, gray-on-gray War Machine car. These cars are made by Silverlit, the same company that designs products for Air Hogs, so I had high hopes for its quality	and	performance. Batteries are not included, so you'll need to supply four AA's for the car and a 9V battery for the transmitter. No big surprises, and for the price, I can't complain that the car doesn't come with a rechargable pack & charger -- if it's otherwise a great car. When I first turned on the controller and the car, I was treated to an immediate surprise. The emblem on the hood, representing the power reactor, glows! Not only is there a light in there, but it actually smoothly pulsates on & off. Really classy touch. As if that wasn't enough, there are working headlights, and if that wasn't enough, you can actually turn the headlights on or off from the controller. Once I started driving the Iron Man RC Turbo Racer, things got better again. This car has full digital proportional control for both forward/reverse movement and for steering. That means you can drive at an extremely slow crawl, at full speed, or anything in between, and you can steer either very gently or all the way in either direction, or anything in between. The car drives very smoothly, though the controls do seem just a little sluggish, like there's a slight delay between when I make a movement on the controller and when the car responds. It's not too bad, though, and I was able to get used to it. For a small car powered by just 4 AA batteries, the speed is very respectable, and I really couldn't ask for more. The car has some suspension movement at all four corners, but the front springs are a little stiff. This doesn't hamper the car from being very easy and fun to drive. The Iron Man RC Turbo Racer is a top-quality toy with features that set it apart from anything in its class. It is a little on the expensive side for its size, but you definitely get what you pay for. 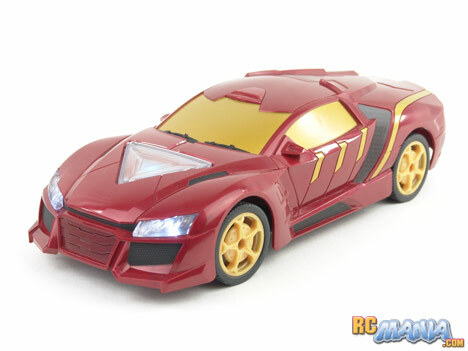 It's marketed for the 5-year-old & up category, and I can easily see this car satisfying an Iron Man or toy-class RC car fan up to twice that age. I even had adults at my test location gawking over it, especially with the hood light and remote-activated headlights. What's more, the car is available in two different forms, and the radio has three selectable frequency channels right on it, so even if two people had the exact same version, they could still drive both at the same time. What more can I say? This is a good car!